What a pretty quilt. I’ve been “making” for several years, though I didn’t always acknowledge it – sometimes I’d do outrageous goodies for my kids’ birthday parties, requiring me to expend enormous amounts of creative energy. Now that they’re a little older I do it just for myself. The family is used to my “watching” television and soccer practices with my ears as I stitch. And I admit it – I will steal the time when I can. Oh, you want to sleep at a friend’s house? Go, go! Hubby, take the other kid camping, please! Oh wow, so glad to find you. 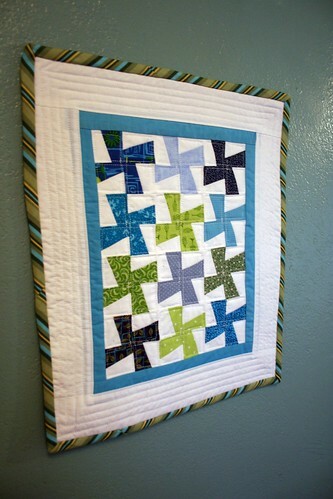 Love the pretty little quilt. Sometimes I get up earlier than the usual rising time and ‘touch fabric’ before work, do even 10 or 15 minutes of sewing or cutting for a quilt. That way I have a physical memory of the project during the day and it helps me want to get back to it. Or I might take the current project to work and put in a few stitches during morning break and/or lunch. It helps keep the connection with the project so it doesn’t fall to the side in the rush of days. I like an uninterrupted hour or two to go in and sew, but how often does that happen? I used to never have time.. then I got ill. apprently stress related… so I had to de-stress… quilting ! hurrah ! best thing ever. and even better.. doctors orders so I don’t have to feel quilty ! That is a beautiful quilt! I love the colors/fabric choices…I make time for making by scheduling it in. With an infant, I have to arrange time that my husband can take him and give me a block of time to work. I try to be ready to start as soon as possible so that my limited time is put to good use. It never feels liek enough though! I make time for making things because it’s int eh top 5 things that make me happiest. I guess that helps me carve out the time. In addition to meeting up regularly with a small group of quilters every 2 weeks, I try to do some sewing/quilting/craft magazine reading every day. I steal a bit of time before work and after my son has gone off to school. And in the evenings i try to have something to work on that allows me to be near or with my family. Like sewing a binding, doing applique, etc. The meetings with other quilters gives me deadlines to shoot for and I’ve recently discovered that I like having small goals, like make of x number of quilt blocks a week. I make time by using little bits of free time between getting home from work and before fixing supper and then a little more sewing in the evening. I make time by ignoring my housework – LOL! Or just trying to save an hour of my weekend for me! I make time after work or on long car trips….I love knitting, so I try to do it whenever I can! I make time to make time just like I did when I worked full-time. I still keep a calendar and block out “Me Time” just like I would when I was making sales calls all day long. I’d be lost without my calendar. Okay, does that count as an entry???? PLEASE PICKE ME!!! I LOVE THE QUILT!!!! I love this so much. I really hope I’m chosen. I subscribed to your blog in Google Reader. The secret phrase is so nifty… how in the world do you insert secret phases only visible in the reader. 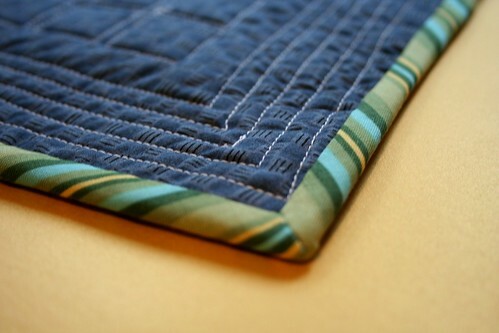 Wow – for your talent both in quilting and in blogging. “Make Time for Making.” I am a very busy student (in a doctoral program), and at times I am overwhelmed by my homework + my desire to embark upon large projects. I have found though that if I don’t indulge my need to create, I become anxious and progressively crabby over time. I really think that for me creating is a necessity for mental well being. I think that balance is crucial to find. No aspect of well being can ever be ignored and happiness be maintained… Spiritual, Emotional, Mental, Physical, and Social health are all critical!! I guess I find time for making simply because my body craves it, just like food – it’s a must. 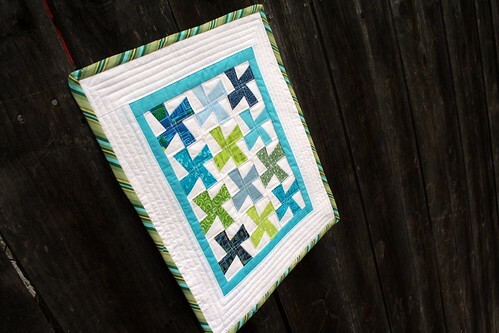 🙂 Please pick me because I’d love to place this gorgeous mini-quilt on the wall in my new rental house!! Your giveaway is posted on the right side of my blog! I hope it brings you lots of entries. GREAT giveaway entry ideas, by the way. You’ve set the bar for the rest of us! Your giveaway is live on my blog The Fifty Factor – See the right hand column under the chocolate chip cookies! the way I make time for making is to ‘make’ my husband bathe my son or I somehow steal the time from some other activity I should be doing instead. I make time for quilting by making time for myself. 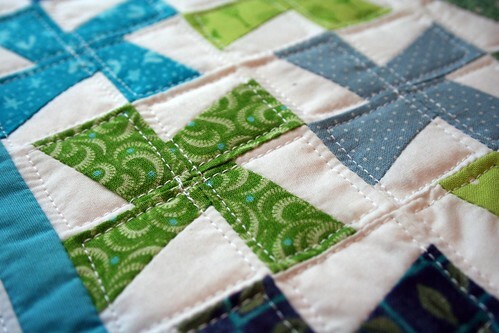 Quilting brings me joy and helps me share that joy with other people. It inspires and challenges and me and let’s me play at being an artist. One special way is to pack up my sewing machine and several projects and head to the beach. I can enjoy being outside on the beach, but also have uninterrupted time to spread out projects and sew, sew, sew! Congrats on your 100th post!! 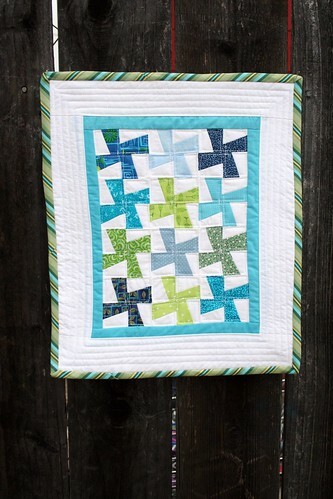 I love your mini quilt – the colors are fabulous and the binding sublime! To answer your question, I can always make time to sew and create as I’m single. Your blog is wonderful and I look forward to seeing future ones. Tutorials would be wonderful, BTW! I make time for making because I HAVE to – if I didn’t, I’d go insane! Making things, the whole creative process, is my outlet for peace – I can put aside all the “junk” of the everyday mundane and make something that adds a bit of beauty to the world. And, if it sparks a smile or two from my daughters, that’s a big reward as well!!! I make time for “making” by being retired. Lucky Me. Hope I’m lucky here too! I make time for making by multitasking. If the TV is on, I’m knitting. If I’m waiting in line at the post office, I’m knitting. It helps that I always have a small project with me. Congratulations on your 100th post. I look forward to the next 100! This is a great and thoughtful blog. It seems that at the moment I’m not making much time for creativity at all (not of the sewing, crafting kind anyway). But this too will cycle back around and I`ll find myself beavering away at a project or two, findng pockets of time in every day to dedicate to crafting. That said, for me, it’s not always about “available time” that makes the difference in whether I create of not. Other factors like purpose, meaning, confidence, energy, materials and inspiration all play their complex part in my creative life as well. Oh for it to be more straightforward than that! Well done on a great blog! First time visitor, found you on flikr. Darling quilt!